How often have you looked at someone who passionately disagrees with everything you stand for and thought, “just look at the facts! You can’t argue with facts, if these people would just look at the truth they would have to change their minds!”? I’m discovering that with some people, no matter how often the facts are crammed down their throats, their beliefs will not change. If we just took our kids away from educators, maybe then they'll get their facts right. The following are written works and information gathered and contributed by Luke Historians. Are You A Luke Historian? 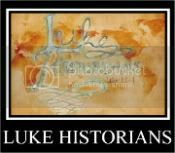 If you take interest in the Luke Historians mission and would like to share some of your writings, send an e-mail to lukehistorians@yahoo.com. Provide your blog address and samples of your writing. You do not have to sign up to publish articles at any set time - just apply to syndicate them through the Luke Historians network.